According to the Centers for Disease Control and Prevention, between 1.6 million and 3.8 million concussions occur in the United States each year. A staggering 65 percent occur in children and teens, many of which are experienced during sports and other physical activities. In March, Shipley’s Athletic Director Mark Duncan was featured in a MetroKids article, “How Can You Tell if Your Child Has a Concussion?” in which he provided insights into what Shipley does to prevent concussions and head injuries in its student-athletes. #1. Train coaches, parents, and athletes on the signs, symptoms, and treatment of concussions. 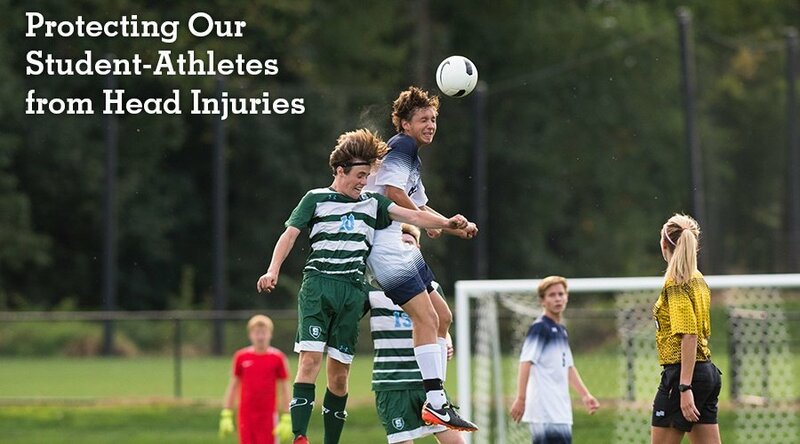 At Shipley, we train everyone who touches the athletics program, from parents to coaches to the players on the field, to spot the signs and symptoms of concussions so injured athletes can be treated right away. If an athlete experiences a blow to the head, the signs of a concussion we look for include appearing dazed or stunned, confusion about an assignment or position, forgetting an instruction, appearing unsure of the game, score or opponent, moving clumsily, answering questions slowly, losing consciousness (even briefly), and showing mood, behavior, or personality changes. If a student-athlete expresses any of these signs or symptoms, we encourage parents to seek medical attention right away and to keep them out of play until a medical professional confirms they are safe to resume physical activity. #2: Teach parents and athletes about the risks of head injuries in their sport. Education is an incredibly important aspect of our athletic program. We take safety protocols and procedure very seriously and provide ample opportunity for parents to learn how to best keep their children healthy. One of our more recent events, “Life Beyond Athletics,” invited parents in the community to hear from experts about the importance of balancing academics and athletics to avoid overscheduling and subsequent injury. Today, we see some parents overscheduling their kids in athletics. Their children are juggling club teams with their school teams, playing every season of the year and in tournaments every weekend. The more a child is playing sports, the more they’re exposed to injury. Shipley also prominently displays Concussion Information and Policies on our website, as well as information from the CDC and our partners, so parents and students always can access this information. #3: Leverage equipment and technology to keep athletes safe. We incorporate technology and data into our decision-making processes to help keep our student-athletes safe out on the field. We’ve enacted proactive policies like banning heading in Middle School soccer and implemented cutting-edge technology like our Triax G-Force sensors to monitor blows to the head in Upper School contact sports. #4. Partner with leaders in the field. Safety has always been our number one priority, but since the correlation between contact sports and traumatic brain injury has become much more evident, we’ve been working with organizations like the Children’s Hospital of Philadelphia (CHOP), University of Pennsylvania, and the Concussion Legacy Foundation to protect the developing brains of our students. In our partnership with CHOP, Shipley student-athletes have volunteered to be the subjects of an ongoing study, the results of which will help professionals better evaluate whether a child has had a concussion. Read more about Shipley’s Concussion Prevention Program. Read Mark Duncan’s interview with MetroKids.